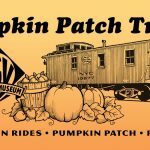 Enjoy a real train ride to our pumpkin patch, where every child takes home a free baby pumpkin. Visit with friendly animals in the petting zoo, and tour the largest collection of historic trains in New York State! Train rides depart every half hour from Industry Depot, ticket includes railroad museum admission, pumpkin patch, petting zoo, and more! Train rides depart every half hour from Industry Depot, ticket price includes railroad museum admission, pumpkin patch, petting zoo, and more!